Produced from 1968 through 1974, the AMC Javelin was inserted into American Motors lineup as their pony car answer to the competition put forth by Detroit's Big Three: GM, Ford and Chrysler. 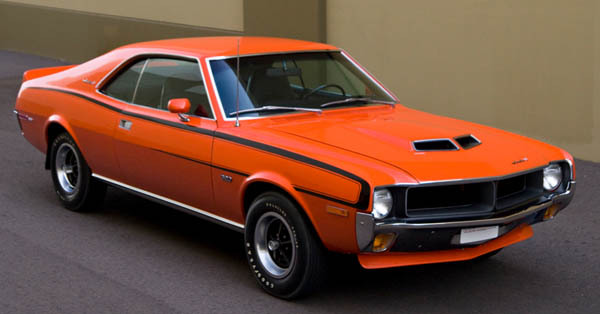 To fit into a wide variety of budgets, AMC offered the Javelin with a variety of engines that included everything from the stately 232 cubic-inch inline-six variant all the way up to the mightiest of AMCs eight-cylinder power plants. At Javelins introduction, the 343 cubic-inch four-barrel V-8 was a serious performance machine that offered with 280 horsepower and 365 foot-pounds of torque on tap, while the cars were made available with optional disc brakes and wide tires that helped keep the power under control. AMCs previous attempt at a Mustang beater had been in the form of the erstwhile Rambler Marlin for 1965. Undaunted, AMC’s chief designer (and Packard/Studebaker veteran) Richard A. Teague quickly revised the design that resulted in the AMX concept cars that dawned late in the 1960’s. Pressured by AMCs upper management as well as by those with serious financial interests in the company, the Javelin production car that resulted from these prototypes was sent to market. Javelin borrowed heavily from the AMX concept’s design and was considered by many to be sporty, modern and attractive in one package. The design was uncluttered and smooth with its split front grille and semi-fastback roofline while the interior featured opulently-appointed front bucket seats and rear bench for a mid-range car of its caliber. The standard suspension was comprised of coil springs and unequal-length wishbones in the front and semi-elliptic leaf springs and sold axle in the rear.